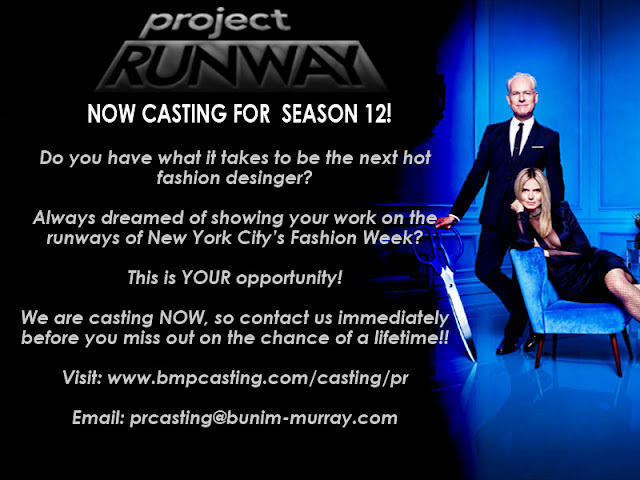 Project Runway is now casting for Season 12! Are you interested in applying, to get greater exposure for your designs? We're excited to offer designers the chance to show their work during New York Fashion Week, and the opportunity to win $100,000 to launch or expand their own fashion line. If Project Runway isn't for you, I'd love to hear which local designers are on your radar. I'd also appreciate if you can help us get the word out via your email list, Facebook, Twitter. Please note, the financial cap to qualify for the show has been adjusted, and if you were not able to apply in years past, you may be eligible now. Learn more and download the application at http://www.bmpcasting.com/casting/pr/. Internet Explorer (IE) has some trouble with that site, so if you're experiencing any difficulties, try opening it in another browser. The application deadline is April 8th, 2013.